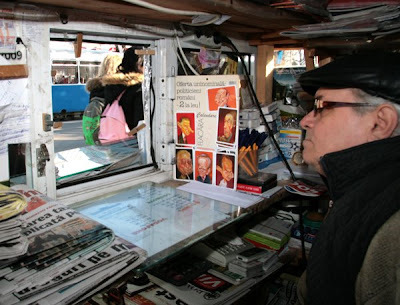 For the last ten years, Titi (short for Constantin) has framed the world, his customers and his commerce through the window of his kiosk on the busy Carol I Blvd, surrounded by the university buildings of the Copou neighbourhood of Iaşi. Watching taxi drivers jostle for parking spaces and streams of students flood by, he sells newspapers, magazines, stationery, tissues and other convenience items. Some university professors have been customers for many years. They have Titi’s mobile number and might ring, even quite late at night if they’ve just seen a book or magazine ad on the telly, to ask him to keep a particular publication aside for them the next morning, which Titi stows away on the shelf below the counter or the shelf above the window. The outside of the kiosk is covered in a scaly skin of magazines, with the semi-dark interior lit by artificial light. An electric heater keeps Titi and his wife Elena warm in the bitter cold of winter, when temperatures can drop too -15 C. On chilly days, the window is opened only when customers approach. Elena opens the kiosk at 6am every morning. Titi takes over at about 10.30 and works through to around 9 at night, earlier at weekends or during the college holidays. Last year, they took their first break in nine years, a month-long road trip around the mountains of Romania with their son and his fiancée. As most kiosks in Iaşi have now been consolidated into companies, sometimes Titi himself wonders how he’s managed to stay independent. Mainly due to his active lobbying of City Hall, he’s been successful in renewing the 6-month lease of his 3m x 1.5m pavement pitch. City Hall has decreed that all kiosks must conform to a standard design so in March 2009, Titi and Elena’s existing kiosk will be transported to his back garden and used to store tools. In its place, they’ll install a new double-glazed design, which they have commissioned to conform to planning regulations. Titi’s previous career was as an electrical engineer on the railways. After restructuring, he was offered early retirement aged 50.